I would really like to see all of my questions and answers on the profile page, even if some of them were deleted, and I don't have enough rep to see them on the site. Since December 2015, users with more than 10k rep (the "access to moderator tools privilege", 2k on beta sites) can use the search operator deleted:1 to see all their own deleted posts. Since June 2013, deleted questions and answers that were posted in the past 60 days, can be seen using the "deleted recent questions" and "deleted recent answers" links on the questions and answers tabs in your user profile. 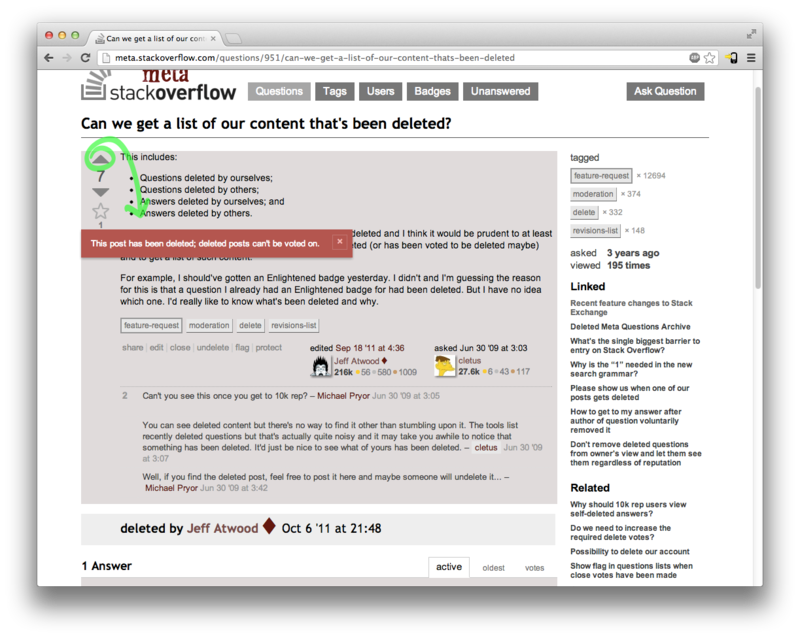 For older posts: as of 23/Apr/2013 you can view your own deleted questions if you already have a link to them, but they still aren't linked from the user profiles (not even just for you). Nor do you see inbox notifications for comments on them if you come back a few hours later. You have to have thought to bookmark your question, or you have to go digging for it in your browser history. Users can no longer undelete posts deleted by moderators. Users can no longer instantly undelete posts deleted by someone else. Questions on the other hand will vanish without a trace for anyone with less than 10k. They'll be redirected to a 404 page, leaving users with little clue as to what happened. They also get no notifications of any kind. Now that 20ks can delete bad questions immediately, it would help to allow anyone to see a list of their deleted questions (i.e. along with non-deleted questions) and access the deleted questions themselves. The comments and the close reason should help everyone but the most clueless to figure out what's the problem(s) with their question and hopefully prevent them from making the same mistake(s) in the future. If this status-declined is not negotiable (at least, without an assassination), an intermediate alternative would be to add an automatic notification to the OP when a question is automatically deleted. Even better, would be an email with the full question for the user. It might in some cases help the user reformulate the question and repost it one year later. I would assume that if a question/answer is deleted by a mod there will be usually some kind of communication between the mod and the user. If not, then I would strongly suggest to add some notification also. I would probably not email the question/answer back in this case. I understand the fear of masses whining, but a short message: "A question you wrote has been automatically removed after one year. For more information about why this happened, please [click here] (link to the faq)" should deter most of it, specially if the OP has a chance to read the question again (on an email, if not in the profile). Regarding those who would complain with that, they are probably doing it now anyway (through email or here in meta), so I do not see a problem either. Thanks for deleting my question! May I see it now? Times have changed on Stack Overflow and this was a closer to on-topic question back then. I do recall that some people agitated for it being a "Community Wiki" question and I do recall thinking that it was pushing the boundaries. But now, it's clearly off-topic and I'm fine with it being deleted. It's not really my community anymore, so I have no reason to whine about it being deleted from the public view. But what purpose does it serve to block me from seeing it? I'm not sure how much value I will get from re-reading this question and its answers, but I have other questions I find more valuable that will, no doubt, be deleted in future as the standards are further tightened. It's not as if I can get questions undeleted even if I wanted to. People will continue to whine about deleted questions whether they can read them or not. At least if we can read our deleted question, we have an idea about where we might have gone wrong. Right? everyone knows the moderators can copy the text and paste it somewhere, so you look like a jerk if you don't comply. posts were deleted for a reason and dredging them up somewhere just gives junk a bigger audience. It's the old Streisand effect once again. If the user has access to their deleted posts, they don't have this particular excuse to raise a ruckus on meta. [Loss] aversion is huuuuge and showing people their deleted content, every day, on their user page is pretty much the textbook definition of it. "Gee, remember your deleted question with allll those upvotes? Look at it every single time you go to your user page. That'll remind you of what you lost, and how much you miss it. Have you considered complaining about the unfairness of that deletion today? How about tomorrow? Maybe next week? Just think about it. Every time. Forever. Low-reputation users do not see deleted questions or answers in their profiles. Trusted users (10k on graduated sites and 5k on betas) can see deleted answers if they are looking the question. They can also see deleted questions if they have a link. Deleted posts (even their own) are not visible on the profile. ♦ moderators see all posts (deleted or not) in everyone's profiles. Now there is a way to find your deleted posts, but while anyone can see their own answers, only trusted users can see deleted questions. The upshot is, nobody but ♦ moderators and employees can see deleted content in profiles, including their own. That's a great design and I don't propose changing it. What I propose changing is if you have the url to your own deleted question you should be able to see at least the text of the question you wrote. Note: The below is outdated. Although this question has status-declined, users can see their deleted questions if they have a link to them, and they can see a list of recent deleted questions via the (far too small and subtle) "deleted recent questions" link on the Questions tab of their activity page. It is simply asinine not to show people their own deleted questions, with comments, at the very least. Scenario: New user asks question and goes to lunch. It's a duplicate of an earlier one. It gets closed as a duplicate, and then three people vote to delete it. New user comes back from lunch and says "Where's my question?" Whereupon they either decide that either the Stack Exchange site in question is clearly rubbish, or they figure they messed up and ask the question again. Neither of which is remotely good for the site. This status-declined needs to be reversed. For instance, how is the user asking this question ever going to see the comments and learn from them? It's going to be deleted any second. @Jeff: The question was about showing deleted questions, not about allowing users to undelete. Surely it would be possible showing them without allowing undeletion. @hendrik it would lead to unbelievable amounts of whining. Will not get implemented as long as I am still alive to prevent it from happening. Judging from that statement, it seems to me like this request was declined based on speculation (and personal opinion). Leads to more users with better posts, because it gives askers another good way to learn from their mistakes. Leads to more ad-revenue, because less new / inexperienced users are frustrated with having their question vanish into thin air and decide SE isn't a place for them. Leads to less tasks to handle for support, moderators and other users with privileges to view/handle complaints in any form, because askers/answerers who lost their posts won't be complaining/asking for support for that reason. Other than these points, it would also solve several annoyances from the users' perspective, but I tried listing it from SE's perspective, so keep in mind that I left those out. What I would like to ask back is "What is it that makes this a feature out of interest to SE?" because I can't find any good reasons not to implement this. This is where I would like the people who knows why this was status-declined to help me out. This may not be the most important feature, viewed from SE's side, but I cannot see how it is in the pile of "Will not get implemented as long as I am still alive to prevent it from happening". If you've ever tried needing to view a post you can't access, you would know how incredibly frustrating it is to be in that situation. Even though this may be a minority of users, it's still important to keep in mind that this wouldn't hurt the users who don't need/want this feature (which is the majority), because like the show removed posts-feature, in the reputation tab, it could just be an optional view, as well as adding notifications of deleted posts which will of course only show up for those who had their posts deleted. To the critique of "unbelievable amounts of whining": From what I've seen in my 4 months here, I don't really believe it. I may be blinded by my frustrating desire to view my deleted posts, but if those affected by this feel the same way, I'm even more inclined to request an explanation of the nature of this belief. My speculation isn't different, seeing as it is also speculation. We're both talking about predicting what the future would look like if this feature was implemented. The main difference is that I tried to thoroughly explain why I think this is a feature worthy of SE, which I think an as popular suggestion as this at least deserves. What I think is by far the most important part of this feature request is notification of deletion done by other users/moderators. Currently, there is no notification at all. This only leads to unnecessary confusion and should be fairly easy to implement. I think the second-most important part of this feature request is to be able to view the question of yours that was deleted. The purpose of this is to let the user see the answers and comments, which are likely to explain the reasoning. I'm unaware if it's possible for 10k+ rep users and moderators to write comments to deleted questions, to discuss them, but if so, those could be hidden from the user if necessary. "This question was deleted by JohnDoe♦ (see the FAQ for possible explanations why your question might have been removed). The user who asked the question. The user who answered the question. Users with 10000 reputation or more. With possible variations like (in this case, you) and a one-liner reasoning by the moderator, if necessary. Even though this shouldn't be an issue, since 10k+ users are told to review answers before deletion, I've still seen a few cases of users desiring to view and, probably most importantly, being able to copy content from answers they provided to now deleted questions. I hope this was a detailed enough explanation to encourage a reconsider, or at least a more detailed reasoning of the rejection. It provides a more accurate history of the user for themselves. Just today I was looking through my old deleted material to see why it was deleted. In some cases, good material was deleted because it had no upvotes and the OP decided to delete their own question. I worry that we're losing more good content when this happens, but no one is bringing it up because they don't know about it. We allow users to see their closed questions, and we get at least one question a day about a question being closed. At least. I don't believe deleted content will receive more questions than that, but without data, who's to say? This should be implemented on a trial basis. Look at the data, and then see if it's a problem. If it's a problem, then let's improve. To summarily say, "Never" to the community without data is just wrong. The situation has completely changed on deleted questions now that we are banning users from asking questions because of their self-deletions and bad questions. We need to enable those users to see their deleted questions so that they can edit them into shape, and if they self-deleted, then undelete them. We need to help and encourage them to do the work to improve. Punishment is only useful when it causes the user to change their behavior, and is just frustration when they have no way of fixing the problems of the past (which since banning doesn't time out is all they can do to get unbanned). We've seen hundreds of posts from well-meaning users who don't understand our policies or just have trouble with the English language. This feature request will go a long way towards enabling them to work their way out once they've learned what they need to do. We are a community of learners. And we work on trusting that basically people are OK. So.... suppose I ask a lousy question, and then I go outside and break my arms (karma). In the meantime BrainyMeg comments about why my question was lousy. Maybe, I dunno, about two chunky comments. My arm is still broken. Then after I heal and can type, and log back into Stack Overflow and check my question link (which I had emailed to myself), I see... nothing - just a "OOPS. This question got deleted." But an expert tried to tell me something, and it's... gone? For lack of... what? Also, maybe I just spent an hour typing this, and want the original one to fix. It would be painful to retype the whole question. Having the question closed is already a punishment to bad questions. Deleting the question only adds extra pain. I think the functionality to view the bad-deleted-question may be granted alongside the ability to vote. It's an early right, but it should be earned just to reach a compromise with Jeff & co ;) i.e. so that the feature is not abused. Now, if a question is egregious, that's a different story and mods can do the disappearing deal. So, overall, it's just greater transparency, which translates to a better user experience. It would be helpful to see at least the closed questions that I have asked, so that as I get more experience, I can look at the questions, see if I understand why they were closed, and get better at writing questions, based on my past failures. At the moment it is hard to learn from the experience, so we just keep repeating the same mistakes. Although this answer may simply be agreement with the other answers here, it seems the community's voice is not loud enough on this issue so hopefully this can expose the problem a little more. This is largely a repost of my own duplicated feature request, which has a slightly different motive than the original request in this post. I typically vote to delete many closed questions immediately (following the PHP tag, there are many bad ones). However, sometimes I withhold the delete vote because there is a solution to the OP's problem in the comments and I want them to see it. Usually something like the resolution to a trivial parse error or typo. Often the question is deleted quickly but it's apparent that the author hasn't seen any of his replies. This seems like a bad reason to not delete something that deserves removal, but I want them to get their "answer" (because I am a nice guy) and I don't want them to try re-asking the question. I assume they can't access their post after it's deleted, and it affects my behavior moderating the site. I'm talking mainly about unsalvagable posts, ones that are solved by fixing a trivial parse error or typo, that cannot be possibly edited into something useful or be relevant to anybody except the author. It affects my moderation behavior (and others I've talked to) by causing me to withhold delete votes, which means more should-be-deleted posts in search results and the "Related" sidebar. It does not help the author understand what they did wrong, and what can be done to prevent it in the future (so, more low quality questions). How is the author expected to learn from the mistake? There should at least be a warning, or inbox notification when your own question is deleted, especially when it's an active question posted only minutes ago. Even allowing a limited view of the post would be a big improvement (maybe only allow viewing for a certain amount of time, not forever). I've just stumbled across this poorly worded question - if you look through the comments it appears that the user previously asked an identical question that was deleted - it occurred to me that this question may well have been deleted before the poster had a chance to read any of the comments / feedback on that question, and may not have even realised that his question was deleted (hence the identical repost). I believe this topic should be revisited, just look at the support in this thread - it's ridiculous. Just because the question is bad (and gets removed) doesn't mean the answers are bad as well. There is no direct correlation between question and answer scoring. If I had access to my deleted answer (with less than 10k rep), I'd write a valid question to the answer and move the answer to this question just to preserve the answer (and it was upvoted several times before the question got deleted ...), but there is no way, because the answer is lost (even for myself). The same may be applicable to deleted questions as well. Sometimes a part of the question was valid, but doesn't fit to the title, so it would make sense to split the question into two. Because the other part of the question was deemed inappropriate, there is no reason to forever remove the useful part. This would have several pros, not least of which is that users can still read comment responses to questions that have been prematurely deleted. A good tie in would be the ability to edit their deleted questions, so that they can fix any problems before they flag for a moderator to undelete them. it would lead to unbelievable amounts of whining. Well, first of all, it has already lead to unbelievable amounts of whining. Take a look at the sheer quantity of answers here disagreeing with the rejection of the request. Secondly, since when has the prospect of "whining" ever been a deciding factor in evaluating policies for the maintenance of the site? Everything from post bans to deletion of old off topic questions causes "whining". I realise there may be a great many valid arguments against this feature request. This answer indicates that something similar was attempted before, and led to poor results (although that refers to showing all deleted content to all users, which is a huge difference of scale). One hiccup I can think of is that it might cause an upsurge in groundless flags for undeletion (i.e. everyone who has a question deleted immediately presses the flag button). All I'm asking for is a re-evaluation of this request, or failing that a less nonsensical rationale for declining it. When MSO gets loads of bug reports, duplicates are eliminated rather fast. This provokes questions from the OP about what happened to their questions (recent example). Notifications are a way of informing users that this has happened. If the notification system is not used, the OP should at least be able to see his own deleted questions. I've added this answer to this proposal to show my support for it (and to bump it to front page once again). The team should reconsider this status-declined. A new user is not very aware of phrasing a question into relevant quotes and often violates format regulations in the phrasing of questions, as I indeed did in my initial stages. It will discourage the new user. Users will not be able to check for the mistakes they made in the questions once they are deleted. It will allow them to edit it into shape, so they can work towards getting unbanned. It will help the new user, not to make the same mistake twice. Encourages them to ask relevant questions in the community. Suggestions and discussions on the deleted questions could be preserved. Once the user gets reputed, downvoted and closed questions might reflect a bad impression on the experienced profile (though since only he can see it, this might not apply). I believe that it's a good idea to keep the deleted questions along with regular questions in the user profile. Create an archive with your data from Google products. Can StackExchange show similar respect for users' data, and allow access to all content they have posted, included deleted questions, regardless of reputation? I would like to see a sandbox mode for deleted posts. To the post's author, mods and (perhaps) 10k or 20k users, deleted posts would behave (for the most part) in the exact same manner as non-deleted questions, allowing editing, flagging, etc. The exception would be voting, which would need to be disallowed. For all other users, the post would effectively cease to exist. A combination of styling and annotations would serve to ensure that everyone able to view it is aware the post is not visible to the site in general. Using this approach, people who have had their posts deleted (automatically or by a mod) or who deleted their post and later regretted it would be able to improve their post, should they be willing to spend the time/effort to do so. A flag could then be used to request undeletion from a mod. Other concerned users (with over 10k rep) might also be able to do so, although I admit I can't see that being much of a use-case. For reasons outlined in other answers, this would allow users who genuinely want to make an effort and learn how to write a good post, or who are willing to do what it takes to overturn a question ban, to helpfully contribute to the site. By allowing edits to be made before the post is undeleted, it ensures only good content is displayed on the site, and reduces mod workload. Deleted questions are already hidden from users under 10k. All that needs changing in this respect is that they should also be visible to the original author. This is already the case for answers. The requisite styling and annotations are already in place on deleted questions. Editing, flagging, etc would need to be enabled for the author, mods and 10k/20k on deleted questions and answers. Given that there's already checks for such things for non-deleted questions (enabling direct-edit for 2k users, for example), I imagine this would only require some adjustments to those checks. Voting is already disabled on locked questions. This would require extending that to locked or deleted questions and answers. I don't like this idea: I want my user profile to look the same, or nearly the same to me as it does to everyone else. I believe it is deleted to conserve space on the server, however, I would be nice if a .pdf file or something were compiled and sent to your registered email account. This way everybody would win. The servers aren't cluttered and everybody would have their answers. It's received a certain number of downvotes, and was automatically removed. Like a couple of other answers state above, it would be nice if a .pdf could be sent to you, but unless you have 10,000 reputation or more, you cannot access deleted questions. In hopes of an update that allows you to view removed questions, there's nothing we can do. I will conject one possible reason, at the risk of violating the absence of discussion, why this has been declined. I recently asked a question which was closed and promptly deleted. It received few views and no votes in the 5 hours for which it was open. (FYI, it has 15 views at time of writing, and 4 of those are mine.) Although the question would've been deleted by the bot in its closed condition anyway, that doesn't explain why it was closed initially. Perhaps it is because Stack Exchange doesn't want users with less than a certain level of involvement to see the question? I can only suppose that it violated some taboo, unknown to me, and that the mod who deleted it would rather that it disappear quietly. Was there some concern that I, or others like me, would pursue a vendetta if the rejection of my question were made more visible by allowing it to remain visible and votable? Perhaps. I can only say, from where I'm standing, that Stack Exchange admins probably want the ability to hide certain questions from the unindoctrinated viewers or users, and would rather that such a thing be itself hidden. The best way to hide it would be to cloak it in the broader facility that is deletion. If this factual, then of course the people who want such functionality don't want it to be popular knowledge; such furtiveness is at the very least internally consistent. Of course, like all puted conspiracies, it would be difficult for me to demonstrate that such a thing is factual. Human psychology allows for the likelyhood; from where I stand, that's all I know. Generally when things get deleted, it's for a good reason, and we don't want users to be undeleting them -- there's a reason we require 10k rep to "see" deleted items at all, and only moderators can see deletions in a user's profile. Not the answer you're looking for? Browse other questions tagged feature-request status-declined deleted-questions deleted-answers information-display . Can the OP see their deleted question? If not, they should be able to. I can see my deleted answer, but not my deleted question? Is there a list of all my posts, including deleted?